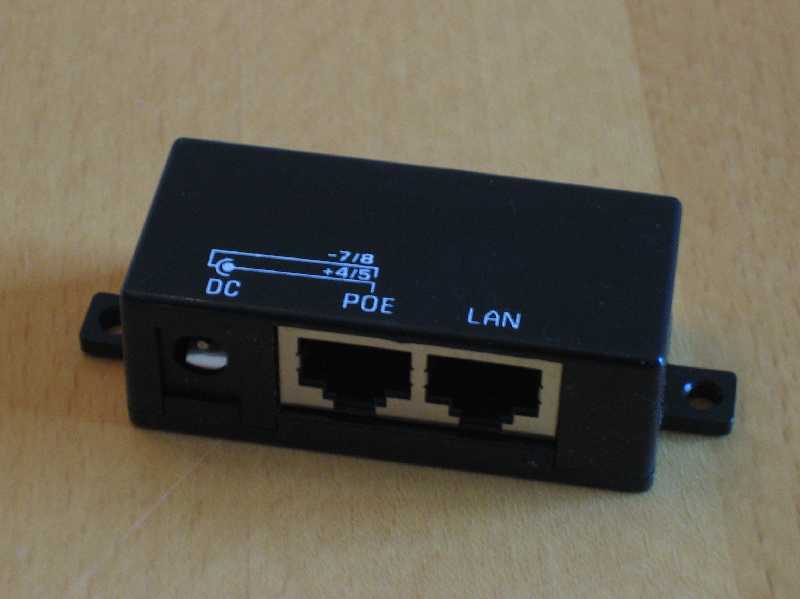 Spec Passive POE (Power Over Ethernet) adapter, uses unused pairs of 100baseT network cable to transmit power to remote device. Pinout DC jack center positive, 2.1 mm pin. RJ45 pins 4,5 = positive, RJ45 pins 7,8 = negative. Passive POE does not comply with the IEEE 802.3af specification. To minimize cable losses, feed the highest allowed voltage, e.g. 18V. For calculating cable losses, try the POE calculators here and here... Keep in mind that ALIX input power is fairly constant over input voltage - when the input voltage drops, the current goes up. Power = voltage * current. To avoid ground loops, ground should be referenced on the receiving end only, that is use a 2 prong (non grounded) AC adapter. Why not active POE ? Cost - 802.3af compliant solutions require a high component count, and compliant switches are too expensive for small installations such as CPE. Board space - DC-DC isolation transformer takes a lot of space. Efficiency - DC-DC converter is required for 802.3af. Typical solution is a flyback inverter, maybe 70% efficiency. Unless you have a very long cable run, passive POE will be more efficient overall. © 2002-2016 PC Engines GmbH. All rights reserved.